We often use medical analogies when describing restructuring procedures. Undertaking a corporate simplification project or ‘group detox’ offers the corporate equivalent of a diet and lifestyle change, cleansing unnecessary and unwanted group companies and creating a streamlined and more efficient structure going forward. A group can save significant cumulative annual compliance costs which only otherwise serve to absorb management resources. The cost of a simplification project can be offset by these savings in as little as a year. We engaged Johnston Carmichael to help us to simplify our group structure. Their trusted advice means our finance and legal teams have the breathing space they need to focus on what is important. Corporate group structures can be simplified by dissolving companies that are no longer needed. These would include dormant companies, or SPVs where the special purpose has been fulfilled and are no longer required, or uneconomic or underperforming subsidiaries. This can be achieved by using the solvent liquidation process known as a Members Voluntary Liquidation (MVL). Solvent companies with contingent or uncertain liabilities can be closed using the MVL process. When it comes to your business, don’t take the risk. 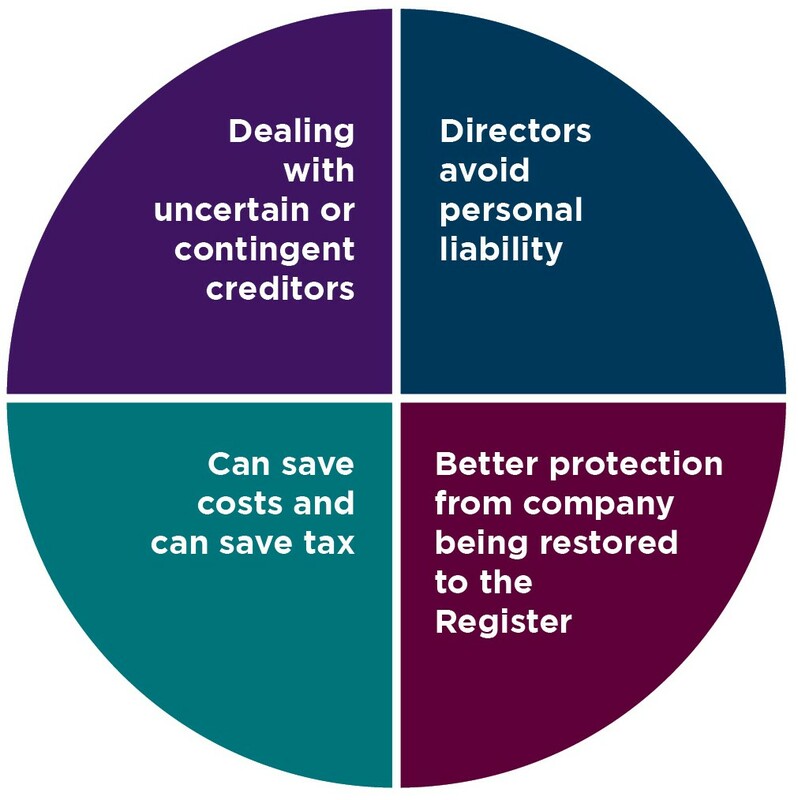 Creditors Voluntary Liquidations (CVLs) – where a subsidiary is losing money and potentially insolvent it may be necessary to consider a CVL where creditors cannot be paid in full. A liquidator takes control of the process and stems any further cash losses to the wider group. We would also provide tax advice to ensure there is no prejudice to tax losses previously surrendered or still available for group surrender. Although in most cases we believe an MVL is the better solution to close down a solvent company it is often the case where there is no risk whatsoever that a straight strike off might be possible and can be a cost effective alternative. We have significant experience of assisting clients restructuring their businesses, using a s110 liquidation process to make the separation of business and assets extremely tax efficient. This is often used to split family businesses contained in a single legal entity or where one company has multiple business operating with different commercial risks. Our tax team will work closely with your legal advisers to restructure assets and shareholdings on a bespoke basis. The Restructuring team at Johnston Carmichael are here to bring a fresh approach to your business. We invest time to really understand your business and your goals. Get in touch with a member of our Restructuring team to find out more about how we can help you streamline your business. Restructuring Partner in our Edinburgh office, Matt joined Johnston Carmichael in 2006.